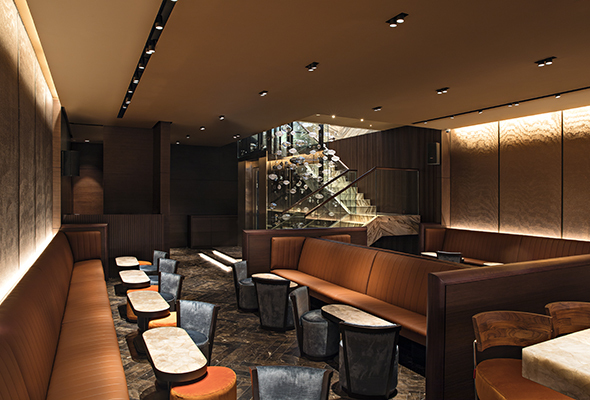 Marea Dubai is the brand-new addition to Dubai International Financial Centre’s repertoire of exclusive venues. Having spent a decade at the top of its game in New York, Marea has earned two Michelin stars and been voted as one of the best Italian restaurants in Manhattan. Run by Altamarea Group, this is their first Middle Eastern venture and includes talent from the original restaurant at the new spot including General Manager, Sean Smith and Head Chef, Michael White. The restaurant is currently in soft-opening phase, and open for lunch and dinner. We popped by to check it out on a quiet weekend lunchtime, when DIFC was lacking the usual weekday bustle of finance professionals. Inside you’ll find space for 125 guests on the upper floor, with a luxurious leather seating and neat white tables angled around the space. 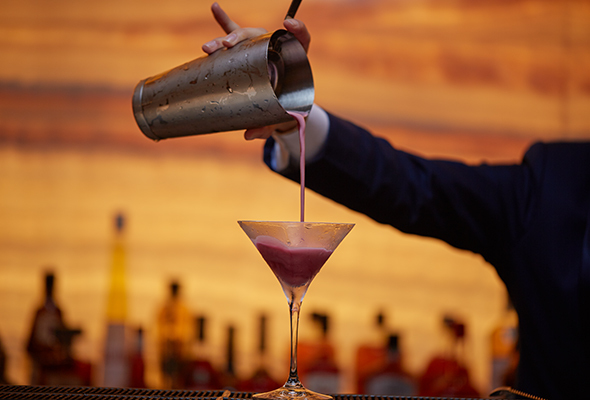 There’s a chic cocktail bar as you walk in, with a wall of amber art glowing from behind and a row of plush blue velvet bar stalls for guests to enjoy a drink before their meal. Downstairs is a more expansive bar area, with low, intimate seating for 65 and a more metropolitan vibe, perfect for live music which Smith says will come at a later stage. The menu offers fine-dining Italian dishes including crudo, caviar, pasta and a variety of meat and fish. 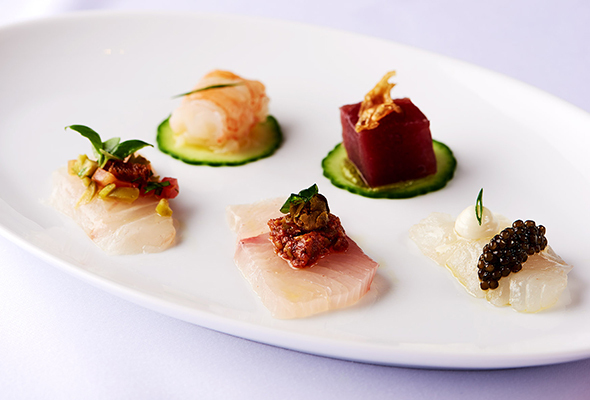 The crudo list offers exceptional, beautifully-presented bites of raw fish topped with delicate accompaniments such as caviar, vegetables or oils and vinaigrettes. The tuna is a flavourful bite of firm fish with crispy artichoke slices that balance the textures perfectly. Red snapper is another highlight, lightly salted and well-paired with castelvetrano olives. Each has its own unique flavour and texture which makes it worth ordering them all. Our second course features two of Marea’s signature appetisers; a green fregola-based octopus dish with sweet apricot drizzle, and burrata with lobster. While fregola pasta might seem to make an unusual appetiser, the portions are manageable and don’t leave a heavy feeling. The burrata has a perfectly stretchy texture, while the baby tomatoes are complimented by the uncommon combination of basil seeds and fresh lobster. The pasta, which we’re told are chef White’s speciality, is made fresh in-house with a variety of styles on offer. 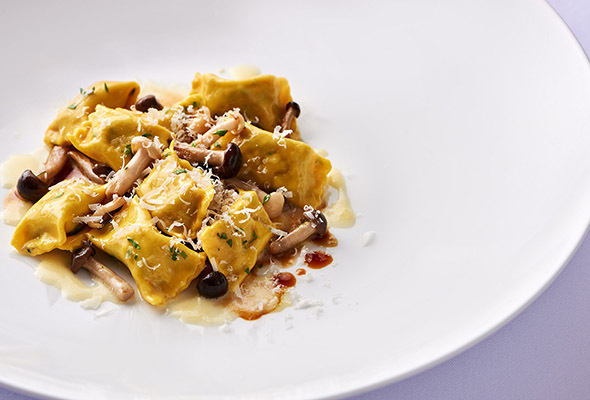 Pansotti is a beautifully buttery take on ravioli, with powerful black trumpet mushrooms and a subtle ricotta filling finished with a creamy white sauce. Fusilli with baby octopus is another favourite which is made up of al dente pasta twists, tasty octopus chunks and shavings of punchy parmesan. For our final course, we opt for a classic Italian favourite – tiramisu. The consistency is lighter than air, with layers of coffee-flavoured cake piped with sweet cream and dusted with cocoa and crumbles of crunchy chocolate biscuit. The first class food is certainly the restaurant’s pull, but we’ll see how the venue fares against the picky DIFC after-work drinks crowd. Not yet a thriving hotspot, Marea Dubai has the potential to reach the status of its American counterpart, only by playing its card right.